World Vision is committed to partnering with the people of Sierra Leone to improve their lives today and to help deliver sustainable solutions for the future of their children, families and communities. Please pray for our work with the poorest children in Sierra Leone. Haja is 15 years old and lives with her Aunt Gladys in Jong community. Like many other children in Jong community, Haja walks to school every day – 6 miles each way. During the Ebola crisis, her school was closed for nine months. Haja remembers, “sitting at home for 9 months was pain as you only hear of death almost every other day”. Before Ebola, Haja walked to school with her closet friends, “during those walk, there were lots of fun and things to discuss”. 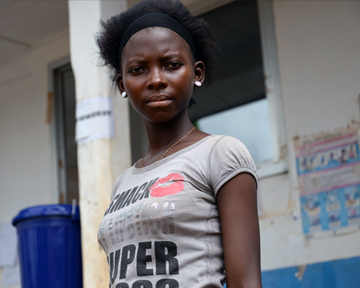 When the Ebola outbreak hit their community, Haja lost 3 of her best friends: Martha. Suba and Salamatu. Haja shared, “I was not able to eat for days, as I think about them how we use to plait our hair in turn every Sunday for school, and we compete in walking to and from school and play so many games on our way back”. Although Haja’s school has re-opened, her 6 mile walk there and back is painful and lonely, as she remembers her best friends. Haja asked if you can pray for the Ebola disease to come to an end as it has brought untold suffering to her community and the country as a whole. She says “I will be happy if the Ebola Virus is prayed for and then it comes to an end, for I want my school walk to be happy again, where we can play games on our way to and from school”. Please pray too that Haja will know God’s peace and love, as she grieves for her friends who have been taken by the Ebola virus. Pray that her and her Aunt Gladys will be able to re-build their lives and shattered community, as the Ebola outbreak begins to get better. Thomas is the father of four children, Alfred and three other children. He became ill six years ago which caused him to become him physically disabled. He has had medical treatment but nothing seems to cure him completely. He now manages to walk around with the aid of a walking stick. His younger brother is trying to support the family. Please remember Thomas and this vulnerable family in your prayers, that God will heal and provide for them in their time of need. Also continue to pray for his brother so that he has the means to continue providing for the children. Kadie is 40 years old and has three children. She is partially blind and was also diagnosed with typhoid fever. She has been responding well to treatment for her typhoid, but her sight remains a challenge as it impacts on her ability to provide for her children. Please pray for her, so that God will help her restore her sight. Pray that she will be able to find ways to earn enough to provide for her children. Mohamed and Anthony, two of our community facilitators for Savings Groups, had motorbike accidents due to the poor road network. They both sustained injuries in their legs but we thank God they both have been healed. Mohamed and Anthony ask you to prayer so that God will protect them from further accidents on their bad roads. We also asked you to pray for Ishiaka, who was seriously ill. We thank God that he is gradually improving. Thank you so much for praying for him. 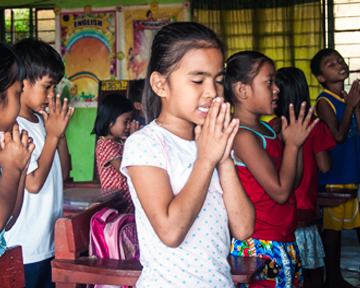 We thank God for our child sponsors and other donors who partner with us to support and care for children and their families. We ask God to bless them and we thank them for changing fear into hope. Marian lost both parents to the Ebola virus that broke out 2 years ago. She is in form 4 at school and lives with her aunt. Marian is in desperate need of educational support. Marian now lives with her aunt, Miata, and her four cousins. Everyday, Marian’s aunt leaves home at 6:30am to start working on her neighbours farms as a casual labourer. Marian and three of her cousins follow later in the day, to help in the work. Marian has been doing this since she was just 5 years old, during the early period of her parents’ death. Marian’s aunt provides her with loving care and makes sure she goes to school, paying the school fees out of her gardening work. However, Miata’s income is small and it is difficult for her to pay Marian’s school fees. As Marian is getting close to taking her National Primary School Examination, which will have extra financial costs, please pray that God would strengthen her aunt’s resolve to be courageous and continue to support her through her education career. Maada is 12 years old. His mother died when he was five. Five months later he was abandoned by his father. Maada has been having nightmares. One night he dreamt that his late mother had appeared to him and instructed him to go with her to the land of the deceased. This has made Maada very fearful. Since that day he has not been acting normally and lives in constant fear. His health has started to deteriorate and he has become anaemic. His aunt, with whom he now lives, took him to the district hospital for treatment, but he is not improving. His aunt is also struggling to provide for herself and Maada. She asks that you will lift their situation to God in prayer to help them cope. Pray that Maada will receive the care and support he needs for his mental health. Pray that he is able to recover from the trauma and nightmares. Pray that his aunt will understand and have compassion for all he is going through. A prayer request was sent out to our supporters on behalf of 14 year old Mustapha in April 2017. He started complaining about problems with his eyes when he was ten years old. Unfortunately, In spite of all medical efforts to help Mustapha, his eye sight is deteriorating every day. The family have developed a strong faith in God and as you to continue to lift Mustapha’s situation to God for His divine intervention and restoration of his eyesight. Pray that the doctors will be able to find and treat the root problem of Mustapha’s eye sight loss. Thank you so much for praying for 14 year old Momoh, last April. He was suffering from an undiagnosed ailment but is now gradually recovering. He no longer falls because of his spasms, neither does he act violently anymore. Momoh’s parents thank God for His divine intervention and thank our supporters for praying with them. They have faith that God will continue with Momoh’s healing so he is able to continue with his education.